One of the most beautiful beach, considered by Outlook, “Maravanthe” is located close to Kundapura in coastal Karnataka. While travelling from Karwar to Udupi through road, the spectacular and serene natural beauty is a rare combination, where rip-roaring Arabian sea accompanies you on one side of the road and calm Sauparnik river on the other. Yet un-explored, with miles and miles of white sand, Maravanthe Beach is perfect for the travellers looking down to relax for some time and then continue journey. Perfect break from routine and enjoy swimming, snorkeling and scuba diving. Crystal clear blue water, white clean sand, cool day time breeze ... It is an exhilarating experience far from the madding crowd. Apart from water sports there are few historical places like Mookambika Temple , Kundapura, Kanchugodu, Belaka Theertha Falls and Baindur (famous for its beautiful sunset). St. Mary's Island, which is well known for its black volcanic rock formations, is worth visiting. Kodachadri hills offers trekking trails but are suggested for professional, but a refreshing dip in Souparnika river is a perfect bargain, as local tale suggests it medicinal qualities. Maravanthe Beach, with its humid climate in summer and blissful winters offers delicious local Manglorian cousines and mouth watering sea food. Tulu and Kannada are the commonly spoken languages here. Mumbai to Maravanthe distance is around 795 kms (approx 14 hrs by road). Delhi to Maravanthe distance is around 2065 kms (approx 33 hrs by road). Mangalore to Maravanthe distance is around 108 kms (approx 3 hrs by road). Mysore to Maravanthe distance is around 361 kms (approx 7 hrs by road). Ahmedabad to Maravanthe distance is around 1297 kms (approx 21 hrs by road). Pune to Maravanthe distance is around 646 kms (approx 12 hrs by road). Goa to Maravanthe distance is around 247 kms (approx 6 hrs by road). Panjim to Maravanthe distance is around 270 kms (approx 6 hrs by road). Kolhapur to Maravanthe distance is around 416 kms (approx 8 hrs by road). Coimbatore to Maravanthe distance is around 514 kms (approx 10 hrs by road). Erode to Maravanthe distance is around 560 kms (approx 11 hrs by road). Salem to Maravanthe distance is around 590 kms (approx 11 hrs by road). Kochi (Cochin) to Maravanthe distance is around 512 kms (approx 10 hrs by road). So, Plan (Cab/Taxi hire Maravanthe) your Visit to “Maravanthe” but Don't forget your camera, as the views are reverential, particularly during monsoons! This small hill station is situated at about 94 km from the Chhatrapati Shivaji Terminus Mumbai. This hill station is a most adored weekend getaway for Mumbai people. Secluded from the vehicle pollution, this hill station gets crowded during weekends. 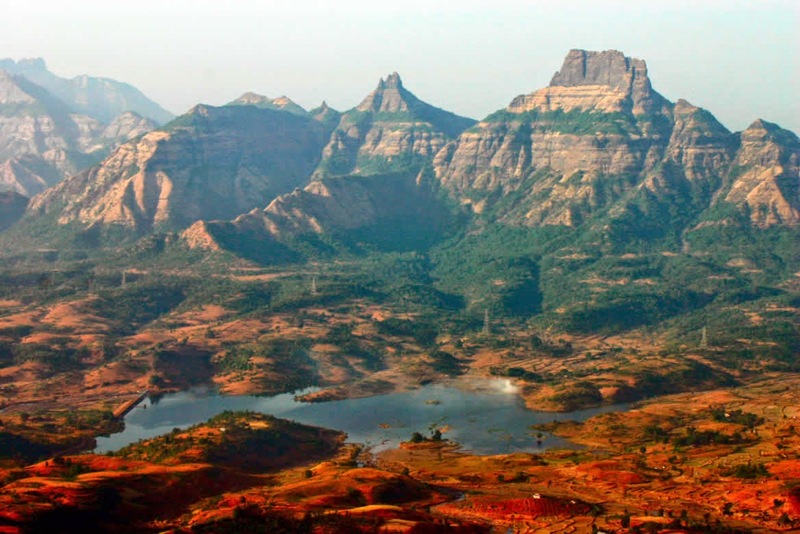 Matheran is declared Eco-Sensitive hill station. Motored vehicles are not allowed within 10/20 km circuit. Even if you go by your own vehicle you will have to park your car at Neral and from Neral a Toy Train takes you to the hill top. Make prior reservation for the train. You can decide to walk along the railway track by enjoying the scenic beauty around. Situated at about 800 meters above the sea level, the hill station provides many viewpoints. You can even watch Bombay city from one point. MTDC self contained rooms are available here. There are private hotels also. Restaurants provide thali (plate) meals. This place is for complete relaxation. Enjoy vehicle free zone, go for early morning walks to refresh yourself and you would be ready for a new week. Malshej Ghat is famous for Flamingos, and it is near the Shivaneri Fort. Shivaneri Fort is the birth place of Shivaji, the great warrior. This hill station also houses Buddhist caves dating back to 3rd century. You can approach this place via Mumbai or Pune. 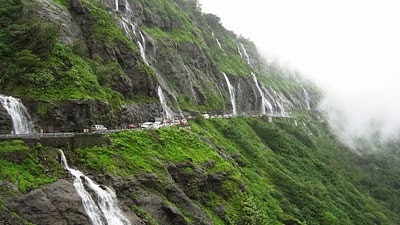 The hill station is located near Thane and Ahmednagar borders. But you can reach the destination by road only. MTDC Flamingo Hill resort is the best option for staying overnight. Best time to visit is Monsoon season when the Flamingos start migrating to Malshej Ghat. Not only Flamingos migratory birds of other kinds also come here during monsoon. You can visit Harischandraghad and Shivaneri fort along with Malshej Ghat. When it comes to vacations, usually a lot of time is spent on planning and preparations. Generally once we decide the place it is explored according to the gathered information, experiences of others (family friends, relatives etc.) and famous tourists’ spots that we read about on internet. Usually we don’t opt for offbeat destinations. We can enjoy the perks of visiting these offbeat destinations. The “hatke” vacation- all the famous places are in list of everybody, very few have the mindset and wish to explore the different place which is not so famous but worth being experienced. “Kuchh hatke” factor is covered here. Crowd free- since it’s an offbeat place it will not be crowded with large number of tourists and guides running behind you to hire them. Mastermind of own vacation- as we will be planning on our own the whole tour one can plan impeccably about accommodation and transportations. Relaxed ambience- because we will be going to such a places which are planned according to our convenience one can stay there as much as they need to relax and unwind themselves as there wont be hurry to miss any famous spot. These are the benefits of going to offbeat destinations. Now these can differ one to one, some of us may like quiet beach to be at or some of us may like hilly areas. Since we are talking about our own country lets take a look at some of the offbeat destinations in India. We have seen sizzling kareena kapoor dancing here in “Raat ka Nasha “in movie Asoka, this is bhedaghat. The main attractions are marble mountains as we can see in the pictures. Narmada River makes its way through these marble rocks making the amazing view. Especially the boat ride here in moonlight in enchanting. While you are riding in a boat a point comes which is known as “Bandar Kodini”. At this point mountains come so close that monkeys can jump across them easily and hence the name of a point is Bandar kodini. The other point that we shouldn’t miss is dhunvadhar waterfalls. The meaning of dhunvadhar is “dhunva” meaning smoke and “dhar” means the flow of water and it truly stands by its name. The roar if this waterfall is heard from far distance. Bhedaghat is in Jabalpur district of MP. We can hire a cab once we reach Jabalpur and reach Bhedaghat. For accommodations there are plenty of hotels and MPTDC guest’s house available. This is a place in Alwar district of Rajasthan. It is on the way from Jaipur to Alwar. It is a prehistoric site. This is included in our list because it is the only legally haunted place in India acclaimed by Indian Govt. Every heritage site has an Archeological office in India but this is the only place where ASI office in not present but quiet a far from the place. The ASI has put the board around the site saying that the entry is prohibited from sunset to sunrise. The fort was built in 1613 and the town was established by King Madho. There are many stories behind this town being haunted but the travelers who have been there claim that the place makes you feel restless and hyper, may be the mindset becomes so due to the tales and ASI boards. Rajasthan is known for heritage palaces and their beauty, so while you have plans to travel in Rajasthan one should definitely visit this strange place, of course during the day. Malana is a town situated in valley called Parvati in Himachal Pradesh. It is also known as the little Greece in Himachal Pradesh. It is an ancient village 3029 meters above from the sea level. We all know the mesmerizing beauty of Himalaya Mountains and hence the famous destinations in HP such as Shimla, Manali then why Malana? It is isolated from the outer world. The citizens of this town consider themselves the descendants of the Alexander’s Army. Every city has its own tale and cultures but this town seem to have many stories. When Alexander came in Asia to his quest of conquering the whole world he was defeated here and while going back, some of his army found solace in Malana and stayed back. These people consider the outsiders inferior to them, so when you travel here you should not leave prescribed path and follow their rules strictly. They have kind of strange concepts which they follow till the date as in even if unintentionally if you touch any person there you have to pay the fine. This goes for any walls, houses and people there. Malana had the one of the oldest democracy in the world. It is a quiet yet strange place because of its customs and their beliefs to visit. Treat for nature lovers to go and relax. It is also infamous for the Malana cream which has the large amount of demand internationally. This is considered to be one of the finest Hashish in the world and that’s why drug mafias and some foreigners seeking for malana cream come here and stay. Indian govt. had to interfere here to control the acts which have not been proven successful so far. People being isolated from the other part of the country had the main occupation of growing the cannabis plants. Gradually things will change here that is what we hope for and the hydro electric power plant is raised here by the govt. which serves as one of the effort for the employment option for the localities here. Exclude the cannabis plantations here from the picture and this is one of the beautiful places to visit when we go to HP. There are many more places in India to consider as offbeat destinations. The best way to reach all these places is reach to the main city near by from these places by any mode of transport which is favorable for you as in by train or air or travel buses and then hires a cab for your journey. The benefit here is it is convenient as well as safe since the hired cab will be at your service all the time. For an ex. CCR Clear Car Rental where we can book our cabs online in advance, can book our ride, I mean the car that we want since they have many options for cars too and plan accordingly. They also have the different packages, as in pick and drop services or destination packages by which we can book it right from picking us up from the airport or railway station and then taking us to the desired destination and drop us back to the stations from where they picked us. Lest pack our bags for some of the offbeat destinations this year and “hatke” tours but safe and sound. What are offbeat destinations in your list? Reply for this post with the names of the places that you have in mind. Situated at the altitude of 1938 m, Nainital is a famous hill station in the state of Uttara Khand, India. It is the head town of district of the same name Nainital district. It is also known as the Lake District of India. Nainital is located in a valley which has beautiful pear-shaped lake. The lake is two mile long in circumference. Nestled with fascinating mountains and beautiful natural surroundings, Nainital has become a popular tourist spot in the state. It has pleasant weather throughout the year and can be visited any time of the year. Nainital is gifted with many places of tourist attraction in and around it. Naini Lake is the main place of interest in the town. The lake is situated in the center of the town and because of this lake Nainital has earned fame as hot tourist spot. Bhimtal Lake is another lake located just 22km away from Nainital. 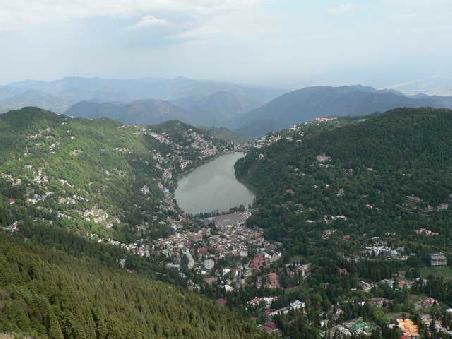 It is the largest lake of Nainital. Nauchia Lake is yet another beautiful lake to be seen in Nainital. All these lakes have beautiful surrounding nature and also offer facility of boating which one can take to explore beautiful surrounding nature. Naini Devi temple is prominent place of worship for the Hindus. It is situated on northern bank of Naini Lake and according to mythology it is believed to be the place where one part of the body (assumingly the eyes) of goddess Sati had fallen when the lord Shiva was carrying her body. Governor’s House is another place of interest in Nainital. It is built in 1899 and is one of remnant monuments of British era in India. It is built in Victorian Gatholic style of architecture and presently is the guest house of governor of Uttara Khand. Prior permission is necessary to visit this monument. Snow view point is another must visit place in Nainital. It is perched at the height of 2260 m and offers tourists picturesque views of surrounding snow-covered peaks and other beautiful sights. Being of the highest peak of Nainital, Naini Peak presents the tourists the most fascinating views of the hill station. The peak is located just 6 km from the center of the town. Tiffin Top, Land’s End, Pangot and Eco Caves Garden are some of other many places to be seen in and around the hill station of Nainital. If you are travelling by train, Kathgodam railway station is the place where you can get down. It is just 35km from Nainital and well connected to it by state run buses or you can hire a car, taxi from other cities to reach Nainital. Kathgodam is furthermore well linked by many trains to Lucknow, Agra, Barely and other cities and towns of the state and the country. Pantnagar Airport is located about 71 km from Nainital and serves as the nearest airbase to it. The air port is well linked by several flights to Delhi.